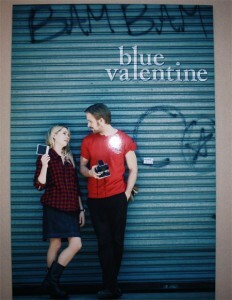 Blue Valentine stars Ryan Gosling and Michelle Williams, showing their tumultuous relationship from beginning to end. The film has received a lot of talk and buzz about the controversy of the initial NC-17 rating that it received. The rating was appealed, and finally did receive an R rating. Director Derek Cianfrance recently took some time to talk to me about his newest film. How did you get Ryan Gosling and Michelle Williams to star in this film? I met Michelle in 2003. She had read like the 42nd draft of the script, and she came to the meeting with a book of poetry and a cd for me. She was just so passionate about the film, and it immediately had to be her to be in the film. But this was pre-Brokeback Mountain days so you can’t get a film financed on Michelle Williams back in 2003 so I had to wait. And I met Ryan in 2005 and kind of a similar thing happened. I felt like the movie was cursed for so long. So what was the process between when you met them and when you started pre-production? What ended up happening was I would keep in touch with Ryan and Michelle, and I would have a nine hour dinner with Ryan or Michelle every six months. We would always talk about Blue Valentine, and it never got old to us. The dialogue continued so much so that I considered them to be co-writers on the film with me because I would go home after these meetings with them so inspired to rewrite the script based on what we had talked about. So they had years of preparing for these characters. By the time we started shooting, they knew who they were as characters. They had so much information. They knew where they went to elementary school. They knew what their best friends name was. They had a history about their first driving test. They knew everything about themselves. So how did it feel once you started on the set? When I started rolling the cameras I felt like I was making a documentary of two people falling in love because Ryan as Dean was getting to know Michelle as Cindy in front of the cameras, and it was magical. I read that you did a lot of single takes throughout the film. To say that it was single takes of everything, it kind of paints not necessarily the right picture. We would shoot all day basically so if we had twelve hours on set we would shoot for eleven of those hours. For instance, there was a scene where he played the ukulele, and she tap dances the scene. That was a scene that we basically had all night of Ryan and Michelle to get to know each other. That’s a pivotal scene where the audience really falls for these characters. How was filming that? We had these twelve blocks of this street, and we started when the sun went down. I just said to Michelle and Ryan that that day was coming, and I was just going to follow them with the camera to see them get to know each other. They just walked up and down this street all night long, talking to each other telling stories about their past, getting to know each other. It was really these characters meeting on the screen for the first time. As you mentioned, Ryan plays the ukulele and Michelle tap dances towards the end of that scene. Was that specifically written in the script or did you have to draw from their own talents? There was this moment in the script where they show each other their special talents. So about a year before we started shooting that I asked Ryan “So Dean has to do something. I was thinking that he could be a musician. What instrument do you think he could play?” Ryan said “I was thinking maybe the ukulele”, and I was like “Can you pick another instrument please. I’m not that crazy about the ukulele”. He said “No, just trust me”. About a week later he left me a voice message playing that song “You Always Hurt the Ones You Love”. It was so great. It reminded me of Elvis Pressley 1955 when he recorded “My Happiness” for his mother. He had that quality to his voice. So I said to Ryan “That’s something to keep in your back pocket”. Meanwhile, I was meeting with Michelle at the same time and asking her “What are your special talents? Can you do anything?”, and she says “Well I used to be able to tap dance”. So I said “Okay, dust off your tap dance shoes. You’re gonna use that sometime in this movie”. So then let’s jump back to that night again when you filmed it. So we were shooting the scene up and down the street. I told them when they came to the bridal store that was going to be their signal to ask each other what their special talents were. So we are shooting, and we come to the bridal store. They ask each other what their special talents were, and neither one of them knows what the other is going to do. They’re doing it, and its happening. They’re just discovering it at the same exact time that I’m discovering it behind the camera. At the exact same time the audience is discovering it. It’s just such a magical moment. Was that a scene you only did once? We did a take two of it, but it didn’t have that intangible to it that it was real. So we were done. We also had like 200 other things on that walk and talk on that night that we could have used that were equally great. With all that footage from that night, and filming other days up to eleven hours, you had a lot of footage to pick and choose from. Tell me about the post-production of the film. That’s why the editing on this movie took a year because we had so much material. So many moments between them. The editing was just torture. The movie is great. Thank you so much for taking the time out to answer our questions.